Hypoxic ischemic encephalopathy (HIE): HIE usually involves damage to the basal ganglia and watershed regions of the brain, but sometimes also includes periventricular leukomalacia (PVL). In this piece, we discuss the most common abnormal presentations, the risks the positions pose to the baby, and how the presentations are managed. Approximately 1 out of 10 babies are in a posterior position rather than an anterior position, which is called an occipitoposterior (OP) position. This means the baby is in a head first position with the back part of her head turned towards the mother’s sacrum (back), or rotated to the left (right occipitoposterior position (ROP)), or to the left (left occipitoposterior position (LOP)) of the sacroiliac joint. This condition occurs in mothers who have problems with their pelvis, such as android, anthropoid or contracted pelvis. Occipitoposterior position increases the baby’s risk of experiencing a prolonged labor, prolapsed umbilical cord, and use of delivery instruments, such as forceps and vacuum extractors. These conditions can cause the baby to experience brain bleeds, a lack of oxygen to her brain and birth asphyxia. Since vacuum extractors and forceps are very dangerous devices that attach directly to the baby’s head, they increase the baby’s risk of suffering a brain bleed. An umbilical cord prolapse is an obstetrical emergency because when a prolapse occurs, the cord is exiting in front of the baby in the birth canal, which usually causes the cord to become compressed between the baby and the mother. If the cord is completely compressed, it means the baby will not be receiving any oxygen-rich blood from her mother. Cord compression and oxygen deprivation will manifest on the fetal heart rate monitor as nonreassuring tracings. When this occurs, the baby must be delivered immediately by emergency C-section to prevent brain damage from birth asphyxia. Indeed, when OP position is present, a C-section delivery will prevent oxygen deprivation in the baby caused by prolonged labor, an umbilical cord prolapse and forceps and vacuum extractor use. The C-section can prevent the baby from having lifelong conditions such as hypoxic ischemic encephalopathy (HIE), permanent brain damage, seizures and cerebral palsy. 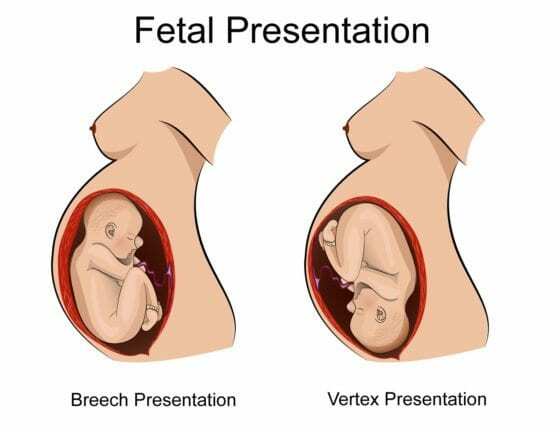 Breech presentation is normal throughout pregnancy. However, by the 37th week, the baby should turn to the cephalic position in time for labor. A breech presentation is when a baby’s buttocks or legs are positioned to descend the birth canal first. Breech positions are dangerous because they can cause a lack of oxygen to the baby’s brain due to a prolapsed umbilical cord, traumatic head injury, spinal cord fracture and problems with labor. In fact, when a baby is in a breech presentation, a vaginal delivery is more likely to result in her death than a C-section delivery. In a recent study, researchers found that the likelihood of dying was 10 times higher for breech babies delivered vaginally than for those who were delivered by C-section. Footling breech presentation: In footling position, one or both feet come first, with the buttocks at a higher position than the feet. Frank breech presentation: This is when the baby’s buttocks present first, and her legs are flexed at the hip and extended at the knees, with the feet near the ears. Complete breech presentation: In this position, the baby’s hips and knees are flexed so that the baby is sitting cross-legged, with her feet beside her buttocks. A face presentation is when the face is the presenting part of the baby. In this position, the baby’s neck is deflexed (extended backward) so that the back of the head touches the baby’s back. This prevents head engagement and descent of the baby through the birth canal. In some cases of face presentation, the trauma of a vaginal delivery causes face deformation and fluid build-up (edema) in the face and upper airway, which often means the baby will need a breathing tube placed in her airway to maintain airway patency and help her breathe. Mentum posterior (MP): The chin is facing the mother’s back, pointing down towards her buttocks in mentum posterior position. In this position, the baby’s head, neck and shoulders enter the pelvis at the same time, and the pelvis is usually not large enough to accommodate this. Also, an open fetal mouth can push against the bone (sacrum) at the upper and back part of the pelvis, which also can prevent descent of the baby through the birth canal. Trauma almost always occurs with vaginal delivery of a baby whose face is presenting, so parents must be warned that their baby will be very bruised and that a C-section is available to avoid the trauma. Babies presenting face-first can sometimes be delivered vaginally, as long as the baby is in MA position. On the other hand, safe vaginal delivery of a term-sized infant in persistent MP position is impossible due to the presenting part of the baby compared to the size of the mother’s pelvis. When a baby is in MP position, she must be delivered by C-section. If the baby is in MT position she must also be delivered by C-section. About 35% of babies in the MP position will spontaneously convert to the MA position during the course of labor, and the majority of babies in the MT position convert, which makes vaginal delivery a possibility. If the baby is in the MA position and vaginal delivery is thus able to proceed, engagement of the presenting part of the baby probably won’t occur until the face is at a +2 station. Indeed, the management of face presentation requires close observation of the progress of labor due to the high incidence of CPD when face presentation is present. In face presentation, the diameter of the presenting part of the head is, on average, 0.7 cm greater than in the normal vertex position. In any face presentation situation, if progress in dilation and descent ceases despite adequate contractions, delivery must occur by C-section. In fact, when face presentation occurs, experts recommend liberal use of C-section. Since there is an increased risk of trauma to the baby when the face presents, the physician should not try to rotate the baby internally. In addition, the physician must not use vacuum extractors or manual extraction (grasping the baby with hands) to extract the baby from the uterine cavity. Furthermore, midforceps (forcep extraction when the baby’s station is above +2 cm, but the head is engaged) should never be used. Outlet forceps should only be used by experienced physicians, but these forceps increase the risk of trauma to the baby and brain bleeds. Brow presentation is similar to face presentation, but the baby’s neck is less extended. A fetus in brow presentation has the chin untucked, and the neck is extended slightly backwards. As the term “brow presentation” suggests, the brow (forehead) is the part that is situated to go through the pelvis first. Vaginal delivery can be difficult or impossible with brow presentation, because the diameter of the presenting part of the head may be too big to safely fit through the pelvis. Shoulder presentation (transverse lie) is when the arm, shoulder or trunk of the baby enter the birth canal first. When a baby is in a transverse lie position during labor, the only way to successfully deliver her is by C-section delivery. Mothers who have polyhydramnios (too much amniotic fluid), are pregnant with more than one baby, have placenta previa or a small fetus (which can occur when the baby has intrauterine growth restriction (IUGR)) are at risk of the baby being in a transverse lie position. Once the membranes rupture, there is an increased risk of umbilical cord prolapse in this position. Thus, a C-section should ideally be performed before the membranes break. 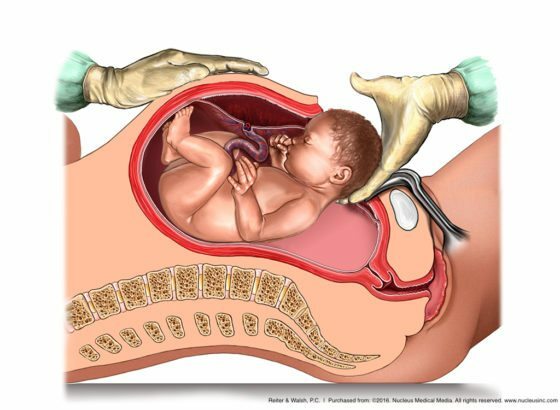 Failure to quickly deliver the baby by C-section when transverse lie presentation is present can cause severe birth asphyxia due to cord compression and trauma to the baby. This can cause hypoxic ischemic encephalopathy (HIE), seizures, permanent brain damage and cerebral palsy. Gardberg M, Leonova Y, Laakkonen E. Malpresentations–impact on mode of delivery. Acta Obstet Gynecol Scand 2011; 90:540. Ducarme G, Ceccaldi PF, Chesnoy V, et al. [Face presentation: retrospective study of 32 cases at term]. Gynecol Obstet Fertil 2006; 34:393. Cruikshank DP, Cruikshank JE. Face and brow presentation: a review. Clin Obstet Gynecol 1981; 24:333. Weissberg SM, O’Leary JA. Compound presentation of the fetus. Obstet Gynecol 1973; 41:60. Tapisiz OL, Aytan H, Altinbas SK, et al. Face presentation at term: a forgotten issue. J Obstet Gynaecol Res 2014; 40:1573. Fruscalzo A, Londero AP, Salvador S, et al. New and old predictive factors for breech presentation: our experience in 14 433 singleton pregnancies and a literature review. J Matern Fetal Neonatal Med 2014; 27:167. Chauhan AR, Singhal TT, Raut VS. Is internal podalic version a lost art? Optimum mode of delivery in transverse lie. J Postgrad Med 2001; 47:15. Okonofua FE. Management of neglected shoulder presentation. BJOG 2009; 116:1695. Brow presentation image: “Face and Brown Presentation.” Health&, 14 Oct. 2016, healthand.com/us/topic/general-report/fetal-position-during-pregnancy.